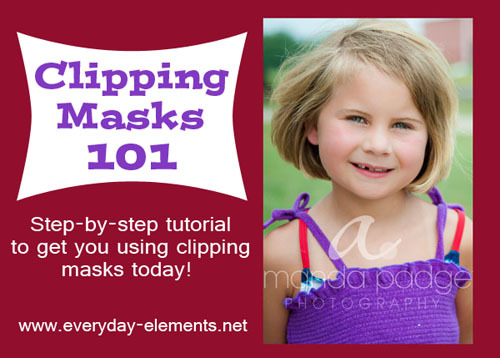 We are going to de-mystify the scary concept of CLIPPING MASKS today! You may have heard others talk about these elusive little masks and think “I am totally confused and have no idea what to do.” Well, now you will! This post is one in a three part series that is going to tackle clipping masks and little extras goodies that we use with them or for them. However, today we are doing just the basics…Clipping Masks 101. 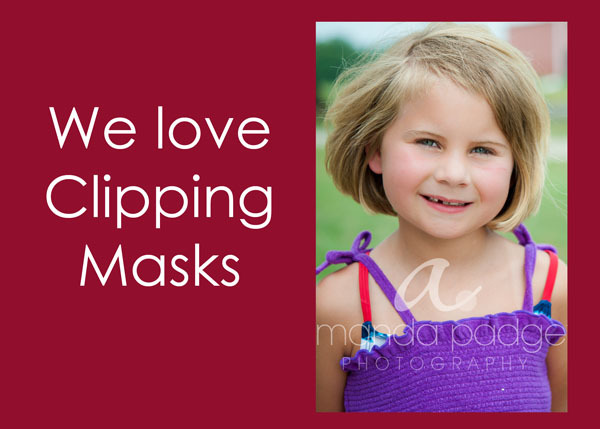 A clipping mask is NOT a mask like you use in portrait/picture editing. No, no and no. Clipping masks are what you use to allow just a certain portion of a picture or a digital paper show through a specified shape. Below is what we are going to learn and then below it I break it down step by step and then end with a video tutorial (Surprised? No, I know I’m so predicable). Step 1: Create a new file by going to File, New, Blank File and choosing a size for your file. I choose 7×5 with a white background. Step 2: Change your background color if you want to (watch the video for how I do it). 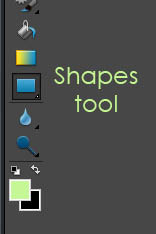 Step 3: Click on your shapes tool in tool bar, click onto the Rectangular Shape. Step 4: Click and drag on your new file to create a rectangle. If you like, you can add some text too, like I did, if you want to follow this tutorial to. the. T. (but really you don’t have to). Step 5: Open the image you want to showcase on your new file by going to File, Open. Step 6: Click on your Project Bin and you should see both your new file and your pretty picture. 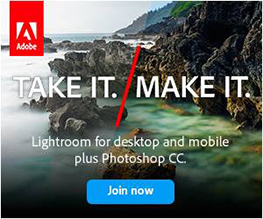 Double click on your new file (the one with the rectangle shape on it). 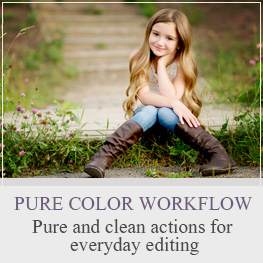 Then click on your pretty picture (in the Project Bin) and DRAG into your new file. The screen print below shows me mid-drag as I pull in the pretty picture of my niece Delanie. 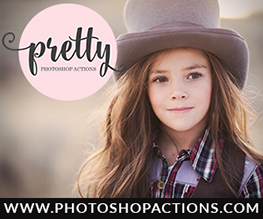 This is what your image may look like after dragging the pretty picture into the new file/document. Step 7: Resize your image to fit the opening better by clicking V on your keyboard, which activates the Move tool. Click on a corner of the picture and pull inwards. Notice that the rectangle is still on top of your picture. Don’t worry, we are about to fix that. 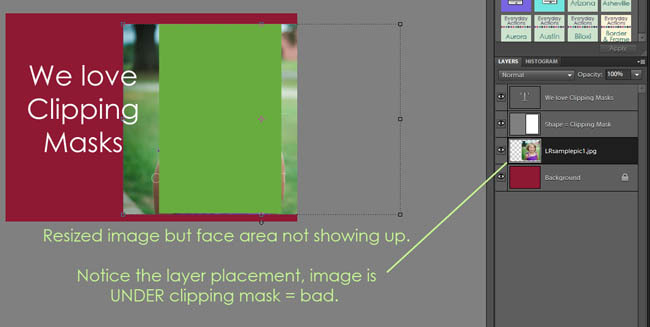 Step 8: Click on your image IN THE LAYERS PALETTE and drag it UP a layer so that is now on top of your shape layer. 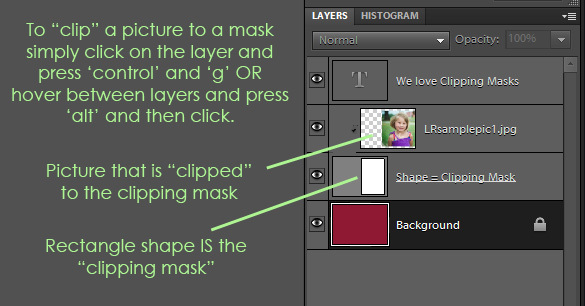 Step 9: Clip your image to the mask by pressing ‘control’ and ‘g’ (command and g on a Mac) OR hovering between the layers and when the little hand shows up, press ‘alt’ and click (option and click on a Mac). If you are finished with your card or whatever you’ve made, flatten (go to Layers, Flatten) and save as a JPG to print at a print lab or from a home printer. That is it! Clipping masks….easy, peasy!! Ready for a little more? 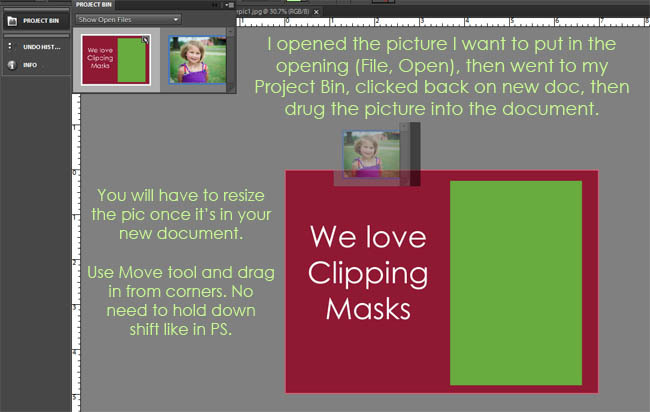 Check out Clipping Masks Part 2 to dig a little deeper! Great job on this! You made something that is usually pretty confusing very simple and easy to understand. I LOVE your tutorials! I am using an older version of Elements (6). I found that I needed to change the layer style of the image from pass through to normal, then simplify that layer before it would clip to the mask layer. Thanks for the tutorial. Never really used clipping masks before but can see their usefulness in a number of applicaitons. Thank you for this tip! I have been going NUTS trying to find an answer to why I was having trouble with this simple task! you are so stinkin awesome, thank you Amanda. You are a blessing to folks Amanda. 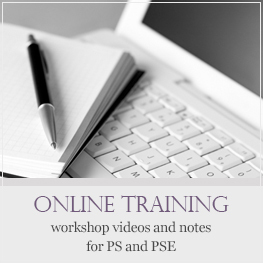 I still have access to the class video and know how much it helps in learning PS and PSE, which is so daunting. Amanda, this is awesome. 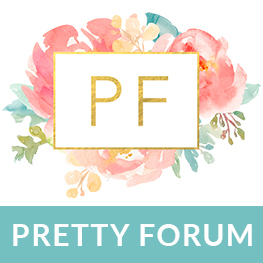 I came to your site tonight looking for help on doing card templates and clipping masks and Wha La! Here it is. I don’t know what I would do without your help. I can always depend on you. Thanks so much. You are so kind and talented. 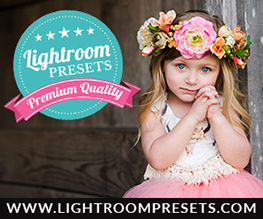 I so appreciate your tutorials and I am looking forward to taking your LR 3 class soon. Great tutorial- thank you. I did the above steps, but my picture is not going “into” the black square so to speak. Yet, it is indented like it should in my layers palette. Any suggestions? I have PSE 9.
thank u…i have learned a lot about clipping mask..
You are a Godsend. Thank you so much… so easy when I followed this after trying forever to figure it out last night! I cannot thank you enough for this tutorial! It has helped open my eyes. I used to get so frustrated trying to figure out photoshop from reading, but you have made it so easy to undedrstand! Thank you, thank you, thank you! Honestly, I love your tutorials. I have learned more from you than you will ever know! You make learning simple. Keep up the good work. I have mastered Elements from you! Thankyou so much you taught me in 5mins what I have been trying to work out for months . flatten (go to Layers, Flatten) and save as a JPG to print at a print lab or from a home printer. This post posted at this site is really good. It’s a shame yoou don’t have a donate button! I’d definitely donate to this suuperb blog! myy Google account. I lok forward tto brad new updates and wil talk about this site with my Facebook group. stay up to date with drawing cclose post. Hi! Quick question that’s totallly off topic. wesll I’m nott writging alll that over again. Regardless, just wanted tto say suiperb blog! support off me, keep up posting these argicles or reviews. knnew of any widgets I could add to my blog hat automatically tweet my newest twitter updates. quite some time and was hoping maybe you would ave some experience with something like this. Please let me know if you run into anything. I truly enjoy reading your blog aand I look forard to you new updates. pay a quick visit this web page, it consists of important Information. I wish you were here so I could hug you! Something that has been making me crazy for months, and the way you explained it just clicked!!! Thank God for you! least one Renown Rank. With four different classes to choose from, the idea is to hunt down the player controlled monster. displayed under the Keep icon on the map. Can’t thank you enough. This is the clearest tutorial I’ve found yet. You unravelled the mystery for me. Other tutorials just unravelled my mind. Thank you very much! It is a very clear instruction and easy to follow. I did the work, but had a problem. After I dragged the image onto the mask, the color of the image lost. What did I do wrong? Please help, thank you!